December 9, 2016 – A United Launch Alliance (ULA) Delta IV rocket carrying the eighth installment of the Wideband Global SATCOM (WGS) satellite for the United States Air Force lifted off from Space Launch Complex-37 December 7 at 4:53 p.m. MDT. This is ULA’s 11th launch in 2016 and the 114th successful launch since the company was formed in December 2006. 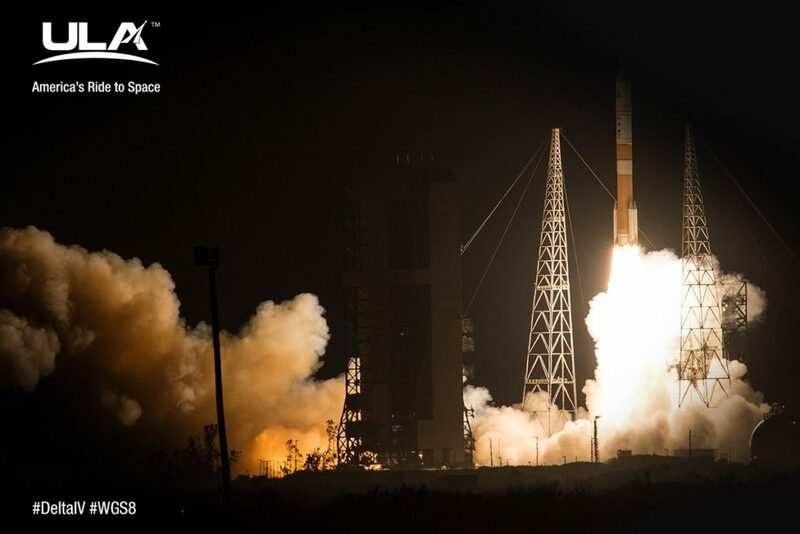 This mission was launched aboard a Delta IV Medium+ (5,4) configuration Evolved Expendable Launch Vehicle (EELV) powered by one common booster core and four solid rocket motors built by Orbital ATK. The common booster core was powered by an RS-68A liquid hydrogen/liquid oxygen engine producing 705,250 pounds of thrust at sea level. A single RL10B-2 liquid hydrogen/liquid oxygen engine powered the second stage. The booster and upper stage engines are both built by Aerojet Rocketdyne. ULA constructed the Delta IV Medium+ (5,4) launch vehicle in Decatur, Alabama.